In The Big Street, a Broadway nightclub waiter falls in love with a crippled singer who selfishly accepts his help without loving him in return. 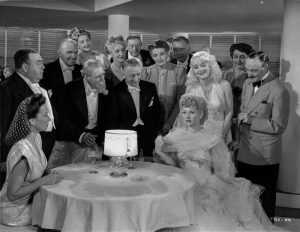 When Gloria is paralyzed after her mobster boss (Barton MacLane) knocks her down a flight of stairs, “Little Pinks” does all he can to speed her recovery, aided by friends and colleagues played by a fine supporting cast of RKO regulars including Agnes Moorehead, Ray Collins, and Eugene Pallette. Lucy’s character may be unlikable but her performance is not; it’s refreshing to see the future TV sitcom queen as a sassy and selfish diva, and Lucy gives the role a subtle dimension of sympathetic appeal. 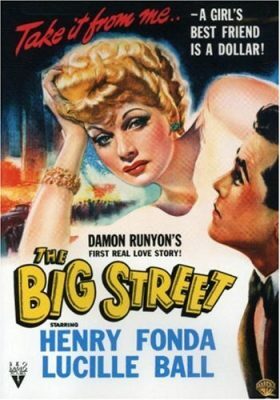 And while the movie’s pitiful depiction of disability is typically maudlin from a more enlightened present-day perspective, The Big Street is noteworthy as a Damon Runyon production, based on Runyon’s short story “Little Pinks” (originally published in Collier’s magazine) and featuring several of the characters (like Pallette’s Nicely-Nicely Johnson) who were later immortalized in Guys and Dolls and other tales of Runyonesque folly. Lucille Ball’s favorite of her films. She felt her performance was unjustly ignored by the Academy of Motion Picture Arts and Sciences. 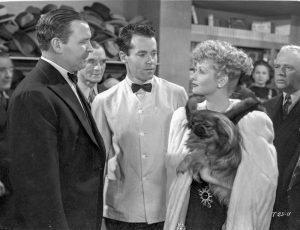 Gloria Lyons (Lucille Ball): Love is something that gets you one room, two chins and 3 kids. Agustus ‘Little Pinks’ Pinkerton, II (Henry Fonda): She’s in bad shape, Doc. Can you do something? Florida Doctor: I wish I could. Agustus ‘Little Pinks’ Pinkerton, II (Henry Fonda): Why can’t you? Florida Doctor: Did you ever hear of a thing called paranoia? No, I guess you didn’t. Well, it’s what happens to people when they get to believe they’re something they’re not. Nicely Nicely Johnson (Eugene Pallette): Now you’re cooking with gas. Violette Shumberg (Agnes Moorehead): Shut up, Nicely. Nicely Nicely Johnson (Eugene Pallette): Don’t tell me to shut up. Violette Shumberg (Agnes Moorehead): I’ll tell you to shut up anytime I feel like it, and I feel like it now. Agustus ‘Little Pinks’ Pinkerton, II (Henry Fonda): Please go on, Doc. Florida Doctor: They can go on for a long time and be okay, except when the illusion is shattered. Then they kind of wither up and… phht. Unless it’s restored. Florida Doctor: I’m afraid what that young lady wants, she’ll never get. Agustus ‘Little Pinks’ Pinkerton, II (Henry Fonda): But we can’t just stand around and let her die! Violette Shumberg (Agnes Moorehead): He ain’t a very good doctor, Pinks. Why, last months he treated Nicely for a cold, and it turned out to be chicken pox. Agustus ‘Little Pinks’ Pinkerton, II (Henry Fonda): You don’t have to be telling everybody I had chicken pox at my age. Violette Shumberg (Agnes Moorehead): If you had chicken pox, you had them. And you had them.